Thanks to the passing of the C2004 Bond, Delta High School now services students from a brand new, state of the art facility. With eleven classrooms now available, we have been able to add 5 new teachers. In addition to the eleven classrooms, the new facility also contains a multi-purpose room, a PLATO Lab, a career center, a staff work-room, the parking and athletic areas which include a softball field and basketball court. Each classroom is equipped with the most current technological equipment available. Delta High School has a staff that is committed to the success of each child. All students are assigned to an Advisor who will work with them in all aspects of their high school education. Students are offered teacher instructed classes as well as individualized learning courses (self-paced) with teacher support as needed. Delta’s state of the art PLATO Computer Lab may be accessed from a home computer also – giving a determined student one more avenue to “catch up”, stay on-track, or get ahead. Delta has high academic standards with a very nurturing and positive learning environment. The faculty and staff want all of the students to be successful at Delta High School. Starting with the class of 2011, students must complete 205 units and pass the English and math portions of the California High School Exit Exam in order to receive a high school diploma. In addition, students who take the responsibility to engage in their education will be rewarded with personal, social and academic growth and success. 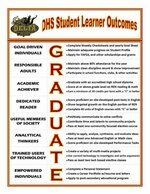 Delta's Student Learner Outcomes (SLOs) G.R.A.D.U.AT.E. were recently updated by the staff and students to better reflect what we felt a Delta student should be able to demonstrate upon successful completion of our program. Each letter represents a quality we wish to instill in our students , and each quality has been aligned to a measurable outcome students can actually produce. We are excited about our SLOs and can't wait to see how our students embrace them this year. ATTENDANCE - Attend all Classes - Attendance to all classes is important. This includes Advisement and Friday classes. If you have excessive absences on Fridays, you risk losing 10 units for two classes. Attendance at a continuation high school (at Delta) is just as important as passing all your classes. Students must maintain 85% attendance or higher in the AM session, otherwise, students may be switched to PM session. Be on Time to All Classes - You need to be on time to all your classes including Advisement. Three tardies equal one absence. School Attendance Review Board (SARB) – Students with severe attendance problems will be referred to SARB. Some of the consequences include a fine ($100.00 or more), community service, juvenile hall, probation, and/or suspension or revocation of driver’s license. Re-Admit Policy - If you are absent, you must bring a written note from your parent/guardian to your advisor within two days of the absence. Absences not excused within two days will become a “cut” (an unexcused absence). The note must include: full name of the student, six-digit ID number, date of the absence, reason for the absence, and parent’s/guardian’s signature. Phone calls from parents/guardians are acceptable to ext. 1710. Check Sheets – All students must carry their Check Sheets to all classes, every day. Check Sheets will be used as passes. You must use your Check Sheet as a pass to go to another classroom, the restroom, or office area. Teacher Assistants (TA’s) must also have a pass at all times. Student IDs – All students must carry their ID card. You especially need your ID card to board and exit the school bus. Replacement ID cards are $3.00. Restroom – The restroom is to be used during passing periods. The restroom is not a place to linger. Discipline – If you break rules during school hours or on the way to school or on the way home, you’ll be subject to disciplinary consequences. Dress Code – Dress is to be neat, clean, and non-disruptive. No spaghetti straps, no showing midriff, no attire with gang symbols, drugs, alcohol, profanity or inappropriate pictures/symbols. Delta Hats– Students may only wear Delta hats or hats with official military logos. No hats with any sports team or other logos may be worn. Students may also wear different colored beanies with no logos or pictures. Delta hats are $20.00 each. Staff Lounge – The Staff Lounge is off limits to students. Students are only allowed in the Staff Workroom with permission. Surrounding Areas – The parks in the surrounding areas are off-limits to students. These are private properties. No student parking is allowed past the block concrete wall on Benji Lane. Check-Out – If you need to check-out during the day, you must sign out at the office and have parent/guardian permission or the permission of the Principal if you are 18 years old. Grad-Nite -To purchase a Grad Nite ticket, Senior must have 85% attendance or higher and no major discipline referrals. Criteria to Return to Comprehensive Site. Student is only eligible to return in August of new school year. have the approval of both principals.